The Committee Room recently spoke with Julie Salamon whose widely praised biography of the late playwright Wendy Wasserstein -- Wendy and the Lost Boys: The Uncommon Life of Wendy Wasserstein -- was just released in paperback. Salamon is a journalist who has worked for the Wall Street Journal and New York Times. Her 1992 book The Devil's Candy, an examination of the making of the screen version of Tom Wolfe's novel The Bonfire of the Vanities, is a classic look at behind the scenes Hollywood. Salamon came to the Wasserstein biography at the suggestion of her editor at Penguin who had been approached by a close friend of Wasserstein, Andre Bishop, artistic director of Lincoln Center Theater. Bishop serves as literary executor for Wasserstein's work including her best known play The Heidi Chronicles which won both the Tony Award for best play and the Pulitzer Prize for drama in 1989. Bishop realized that a biography of Wasserstein, who died in 2006, was inevitable and wanted the project done properly. Salamon, whose immediately prior book Hospital (2008) explored the daily challenges of a busy urban hospital, was initially cool to the idea of writing about a playwright. "I was worried the subject might be too narrow and appeal only to theater people," Salamon explained to TCR. "What helped change my mind was learning a bit about Wasserstein’s fascinating family. What tipped the balance was an article by Frank Rich [theater critic and friend of Wasserstein], written not long after Wasserstein died, in which he talked about how strange it was to learn that this very public artist kept so many secrets. The secrets clinched the deal." Indeed, Wendy and the Lost Boys is as much a family saga as a biography of one of the leading American playwrights of the late twentieth century. The cast of characters includes Wasserstein's father Morris, a ribbon manufacturer who moved the family from a middle class Brooklyn neighborhood to the posh Upper East Side of Manhattan; flamboyant mother Lola, a Polish immigrant who in equal measure lovingly doted upon her children and excoriated them for not being good enough; oldest sister Sandra, a pioneering woman business executive; brother Bruce, a brash Wall Street billionaire with a beautiful young French wife; and "pretty" sister Georgette, who abandons the high pressure New York life to run an inn in Vermont. As an adult Wasserstein discovered that her oldest sister was actually her half sister and cousin -- her mother was the widow of her uncle -- and that she had a mentally disabled half brother/cousin, Abner, living in an institution in upstate New York. Attention to Wasserstein's colorful family does more than provide background information. To a remarkable extent Wasserstein used her family, friends and herself as source material for her writing. As Salamon writes in the prologue to Wendy and the Lost Boys -- "In plays, autobiographical essays, and interviews, she opened her heart and her family album for the world to see. No personal detail seemed exempt from public consumption." However revealing Wasserstein appeared to be, she liberally employed poetic license. Salamon told TCR that the biggest challenge in writing the biography was "untangling the stories Wasserstein told about her life from the way things happened." Wasserstein was born in 1950, deep within the Baby Boom years. Examining the lives of the more affluent members of her generation, especially its women, is a hallmark of Wasserstein's work. "She definitely saw herself as emblematic of her generation, the Baby Boomers. All of her plays are peppered with sociological references; they reflect their moment in history," Salamon told TCR. A mediocre student, Wasserstein graduated from Mount Holyoke College in 1971 with a history degree and no particular ambition. She drifted into writing workshops at the City University of New York taught by novelist Joseph Heller and playwright Israel Horovitz both of whom encouraged her to pursue playwrighting. Wasserstein enrolled at the Yale School of Drama which she later dubbed the "Yale School of Trauma." Her fellow students included actresses Meryl Streep and Sigourney Weaver and playwright Christopher Durang. Wasserstein was the only female in the playwrighting program and her rumpled clothes, nervous giggles, and writing that addressed contemporary women's issues in a comedic way did not impress the school's autocratic dean, Robert Brustein. "There was something about Wendy I found very scary," Sigourney Weaver recalled to Salamon. "She was a more naked version of the vulnerability I felt. I wanted to take care of Wendy, to pull her hair back and give her some armor, and that seemed inappropriate, because I was walking disaster. I resisted the impulse. We didn't become good friends." Failure to shine in drama school was quickly left behind. In the fall of 1977, when Wasserstein was just twenty-seven years old, her play Uncommon Women and Others was produced by the Phoenix Theater, a high profile Off-Broadway company. The play presents a group of college friends (clearly based on Wasserstein and her friends at Mount Holyoke) coming together a few years after graduation. Their conversation, which employs frank language that some commentators thought unseemly coming from a female writer, questions the modern feminist movement's focus on professional achievement while still supporting the movement's larger goals. In 1978, Wasserstein's work reached a nationwide audience when Uncommon Women and Others was staged for television on PBS with an up-and-coming Meryl Streep in the cast. Wasserstein's gregarious nature and wide ranging curiosity led to her establishing countless friendships among personalities on the New York cultural scene. She also maintained ties with friends from her earlier life and with her family. Salamon writes in Wendy and the Lost Boys -- "Wendy found her way to the epicenter of the overlapping circles of young aspirants milling around New York trying to break into show business...[she] became a hub of social connections for her friends and acquaintances...if she wasn't out with a classmate from elementary school, middle school, or college, she was at a party or having dinner with Chris Durang, or at the theater with Frank Rich, or at a Wasserstein relative's child's bar mitzvah." Salamon interviewed nearly three-hundred people for the biography. "I’ve done big, complicated books in the past and have learned a good filing system is crucial," she explained to TCR. "I am also a stickler for transcribing interviews as soon as possible so the workload doesn’t get bogged down in backlog." Salamon had written extensively about films but Wendy and the Lost Boys was her first book about theater. Asked to compare theater to films, she told TCR -- "The theater world seems more innocent to me. Not without its petty jealousies and politics, but certainly very different from Hollywood where the large sums of money at stake have a particularly corrupting effect." The title of Salamon's biography is derived from characters in J.M. Barrie's play Peter Pan and refers to the fact that despite specializing in women's issues as a writer Wasserstein maintained her closest personal relationships with men, many of them contemporary theater luminaries. Counted among Wasserstein's friends were playwright Terrence McNally, costume designer William Ivey Long, and director Gerald Gutierrez, in addition to Bishop, Rich, and Durang. Wasserstein, who never married, sometimes referred to her male friends as "my husbands." Though Wasserstein's literary executor Bishop gave his approval to Salamon's project, the book is not an authorized or official biography. Bishop did not set any limitations or read drafts of the manuscript. Still, Salamon's says his support was vital. She told TCR --"Without Andre’s blessing I don’t think I could have done the book. Many people simply wouldn’t have talked to me." The Pulitzer and Tony Award winning The Heidi Chronicles, is a series of humorous and insightful episodes in the life of Heidi Holland, a successful art historian in her thirties (played in the Broadway production by Joan Allen) who, like so many of Wasserstein's characters, grapples with the expanding opportunities but seemingly endless choices and increased pressures faced by educated women in the late-twentieth century. Wasserstein's Tony Award for The Heidi Chronicles marked the first time a woman writing on her own earned the award for best play. A stage adaptation of The Diary of Anne Frank by married couple writing team Frances Goodrich and Albert Hackett won in 1956. Capturing the Pulitzer Prize for drama raised Wasserstein's profile beyond the theatrical world. "The Pulitzer became very important to Wasserstein's legacy," Salamon told TCR. "In the public mind (and in her own), winning the prize elevated her from a funny New York writer to an authoritative commentator on her times." A 1995 made for television film version of The Heidi Chronicles, with a screenplay by Wasserstein, starred Jamie Lee Curtis. In The Sisters Rosenswieg Wasserstein combined her admiration for the plays of Russian master Anton Chehov, especially The Three Sisters, with her relationship with her own sisters. The Rosenswieg sisters -- a business executive, a housewife, and a writer -- meet in London shortly after their mother's death. The sisters thrash out their status as women, Jews, and Americans. The play premiered at Lincoln Center in the fall of 1992 with Jane Alexander, Madeline Kahn, and Frances McDormand as the sisters. It later moved to Broadway for a long run. With The Sisters Rosenswieg Wasserstein challenged herself to write a "well-made play" with developed characters, plot, and explained entrances and exits as opposed to sketch-comedy like blackouts. Though full of witty dialogue it exhibited a strain of melancholy that was new to Wasserstein's work. Salamon believes The Sisters Rosenswieg is Wasserstein's most accomplished play. "It is the least topical and the one that follows classical theatrical convention most closely," she told TCR. In 1999, Wasserstein, nearing age forty-nine, gave birth to a daughter after undergoing years of fertility treatments. Few members of her vast network of friends and family were told she was expecting and the baby's arrival came as a shock to many. Wasserstein never revealed the identity of the baby's father. 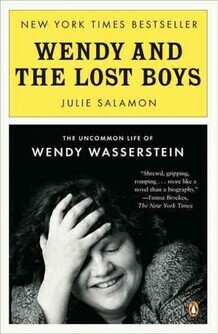 "Wendy had her own definition of privacy," Salamon writes in Wendy and the Lost Boys. "She used self-exposure to draw people in and the illusion of secrecy to leverage relationships, to create a false sense of complicity." The pregnancy was difficult and the baby was premature and frail but gradually gained strength. Wasserstein wrote about the experience in an essay for The New Yorker. Of the essay, Salamon writes -- "Wendy was determined to write the definitive, unassailable version of Lucy Jane's birth...She constructed the story to convey authenticity, providing heart-wrenching and harrowing particulars that signified utmost revelation. But she omitted as many vital facts as she included, because she was also creating a legend." In 2000, Wasserstein began to show symptoms of the lymphoma that would eventually take her life. She continued working despite poor health. Her final play, Third, opened at Lincoln Center in the fall of 2005, when Wasserstein was so weak she was pushed in an office chair, having rejected a more clinical appearing wheelchair, across Lincoln Center to attend a post-performance reception. The story of a liberal female professor (played in the original production by Dianne Wiest) who hurls plagiarism charges at a male student from a blue-blood family, Third brought Wasserstein's work to new level of seriousness with its nuanced look at politics, social class, money, and family connections. Wasserstein died in January 2006 at age fifty-five. Following her habit of selective confidentiality, few of her family members or friends knew about the seriousness her health problems until she was close to death. Her passing stunned the theater world and brought an abrupt halt to a flourishing career. Salamon told TCR -- "With Third Wasserstein seemed to have reconnected with her voice as a playwright. I believe she had more to say and she would have said it." Other Wasserstein plays include Isn't It Romantic? (1983), a sort of follow up to Uncommon Women and Others about two college friends navigating their professional and personal lives as fully fledged adults after graduation; An American Daughter (1997), in which a woman nominated for a high government position endures public scrutiny of her life; and Old Money (2000), a technically complex work taking place in two time periods and exploring New York society through the occupants of a historic Manhattan house. Wasserstein adapted John Cheever's short story "The Sorrows of Gin" into a teleplay for PBS in 1979 and wrote the screenplay for the 1998 film The Object of My Affection, based on Stephen McCauley's comedic novel about a romance between a pregnant woman and a gay man. Wasserstein is also the author of the children's book Pamela's First Musical (1996), dedicated to her niece and celebrating Wasserstein's love for Broadway musicals, and the collection of essays Shiksa Goddess or How I Spent My Forties (2001). Wasserstein's only novel, Elements of Style, about the effect of the September 11 attacks on the lives of New York socialites, was published posthumously in the spring of 2006. "Interview. Wendy Wasserstein, The Art of Theater." Paris Review (Spring 1997). "Wendy Wasserstein Interview (with writer A.M. Homes)." BOMB Magazine (Spring 2001).